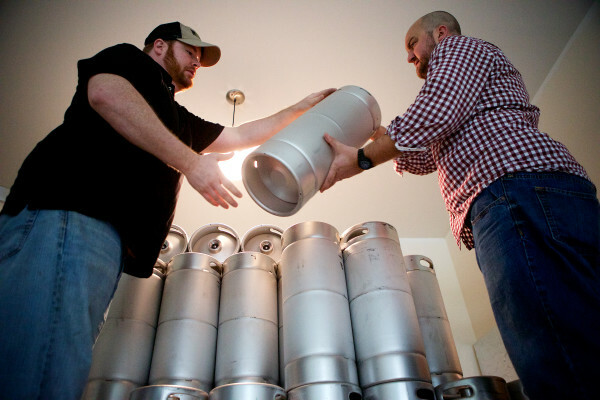 T.J. Hansen (left) and John LeGassey sort kegs while waiting for their first shipment of hops and yeast at Fore River Brewing in South Portland on Dec. 8, 2015. When Adam Tuuri and Eben Dingman looked for the perfect spot for their new craft brewery in Lewiston, they waited more than a year to find their current location at 43 Lisbon St., just off Main Street. It was a fixer-upper, but it was in the block where they had imagined Bear Bones Beer being located, close to three restaurants, and at 8,000 square feet, it has plenty of room to grow beyond the 2,000 square feet now in use. To get established as a brewery, the co-owners of Bear Bones Beer had to first get their area rezoned as light industrial, which would allow other businesses that made things to locate there. Both envision their brewery and tasting room, which are scheduled to open in a few weeks, to be an inclusive space where people of all ages can come to taste their beer. They even make Halal soda, as they are located near a mosque. Bear Bones isn’t the only new craft brewery trying to become an anchor in its community, a place akin to the neighborhood breweries that were common before Prohibition. “At one time people knew their neighborhood brewer,” said John LeGassey, co-owner of recently opened Fore River Brewing Co. in the Cash Corner area of South Portland. “People are starting to get in touch with people who work in these industries.” He points to a well-trodden path in the snow between two houses across the street, where customers cut through from a block away. Fore River has an open concept layout where customers in the tasting room can see the beer works in the next room. “We wanted people to see us working while they have a beer. It engages them,” he added. The tasting room also has games like cribbage and Scrabble that patrons play while drinking a couple beers over one or two hours, he says. Fore River has 2,000 square feet, but hopes to expand with an outside seating area once it gets permission from the city. Another neighborhood anchor will be Bissell Brothers Brewing Co., which will relocate to Thompson’s Point in the second quarter of this year. Having other craft brewers in the area helps stimulate business for all, notes LeGassey. Eli Cayer, founder of Urban Farm Fermentory and the new Gruit brewery, can attest to that. Once the only fermentory in the East Bayside neighborhood of Portland, UFF has been joined by Rising Tide Brewing Co., Maine Craft Distilling, Bunker Brewing Co. and, soon, new brewer Lone Pine Brewing Co. The neighborhood is the most diverse in Portland, according to the 2010 census, with 60 percent white compared to more than 94 percent for the state as a whole. The area is 21 percent black, 6 percent Hispanic, 8 percent Asian, 1 percent Native American and 4 percent multiracial. UFF operates in 10,000 square feet, including 6,000 square feet for production, 2,000 square feet for the tasting room and performance area and another 1,500 square feet for the art gallery and hallway. The space hosts a craft market on Saturdays and UFF also plans to sponsor a 5K in the spring from its parking lot through the Maine Trails near it and to the narrow gauge train depot and back. While UFF initially had a winery license for its fermented cider and kombucha, it now has a brewery license and plans to soon offer gruit (pronounced “grew it,” an herb flavoring for beer) and Braggot (mead made with honey and barley malt). Distinguishing your brand is getting more important as the craft brewing market continues to grow. Maine already ranks fifth nationwide in the number of craft breweries per capita, with 37 as of 2012. And while only a handful of craft brewers opened up in the state in the past six months, Sean Sullivan, executive director of the Maine Brewers’ Guild, expects the pace to pick up this year, with at least 13 craft breweries on tap to open in the first half of 2016. One, Northern Maine Brewing Co. in Caribou, will be the first in Aroostook County in a long while. LeGassey of Fore River says there’s no issue with market saturation of craft brewers now, and with neighborhood brewers coming back into fashion, there’s plenty of room for growth. “Breweries are starting to have different things like sours and are using other types of bacteria and wild ingredients, like UFF’s different fermentables and gruit,” he said. Fore River makes three beers: John Henry, which is an oatmeal stout, plus Irish Red TimberHitch and Lygonia IPA. Like Fore River, Bear Bones is the first brewery in its neighborhood in Lewiston. The two owners were born in Lewiston and met in middle school on the cross-country ski team. They started the brewery in 2013, and experimented with recipes out of their home until they found their current location. The name for their brewery came from Tuuri telling Dingman that he was ready to start a brewery and wanted to keep it minimalist, or bare bones. “We wanted to keep things simple. Everything we can reuse we do,” Tuuri said of the brewery’s emphasis on kegs and refillable growlers and minimal waste, with no disposable bottles or cans. He blew the glass for the light fixtures, and the two reused wood and other construction materials found in their building and elsewhere. Even the carriers for the growlers — available for $50 each — were made by a local woodworker from the old wood lath that was used in the past to hold plaster on walls. They salvaged an industrial stainless sink for $250, and refinished the inside of the tasting room and brewery themselves, a process that took more than a year. The goal was to be thrifty in their two-stage build-out, and make a comfortable space where everyone could come and drink beer or their homemade Halal ginger soda. And while both men like the popular IPA ales, when they did taste-testings in their neighborhood, they discovered they were not popular. “So we listened to our customers,” Dingman adds. The brewery is making Double C.R.E.A.M., Old Smokey pale ale, plus a hoppy seasonal ale and rye brown ale. The plan is to get people in the door to both taste their beers and then buy and take them home in growlers. And the men welcome other breweries in the area.